Many things may underlie a case of back pain, from disc injury to psychological issues to tissue changes that occur over time. In recent decades, the idea that your fascia — thick connective tissue that covers, organizes, and supports all the muscles, bones, tendons, ligaments and organs of the body — may be the source of back pain has been investigated with piqued interest by scientists and lay practitioners alike. When you have nagging low back pain, you likely want to know what's causing it — so that you can make it go away. Well, there's a big broad, flat sheath of fascial tissue that lives behind the spinal column and is positioned at both the lumbar (low back) and thoracic (mid back) levels. This area of fascia is called the thoracolumbar fascia, the lumbodorsal fascia, or simply, LF. When you look at the thoracolumbar fascia from the back view of an anatomical drawing or diagram, you can see that it makes a diamond shape. Because of this shape, its large size, and its fairly central location on the back, the LF is in a unique position to help unify the movements of the upper body with those of the lower. The fibers that make up the LF fascia are very strong, enabling this connective tissue sheath to also lend support. But fascial tissue also has a degree of flexibility, as well. It is this quality that enables the LF to help transmit forces of movement as the back muscles contract and relax. And the thoracolumbar fascia is a key player in contralateral movements. A perfect example of this is the act of walking. Scientists and doctors don't know for sure, but it's possible that the lumbodorsal fascia may play a role — or even more than one role — in the presence of low back pain. A 2017 study published in the journal Biomedical Research International found that the lumbodorsal fascia may generate back pain in three possible ways. First, if you sustain micro injuries and/or inflammation — often the two are related — these may stimulate the free nerve endings that live in the fascia. Free nerve endings are, as the name suggests, the ends of nerves that arise from your central nervous system, i.e., your brain and spinal cord. Their job is to pick up information at the outer reaches of your body such as your skin and fascia, and relay it back to your central nervous system. As the theory goes, when the fascia that's close to your skin, as the LF is, becomes damaged, or infused with inflammatory substances these "insults" are communicated back up to your brain and spinal cord for processing and response. By the way, fascia has many, many free nerve endings. Second, after an injury, it's common for tissues to become immobile or overloaded. This is actually a structural change — one that may change your sense of posture and the way your body moves. Believe it or not, structural changes such as these may affect pain levels as well as the quality of the pain you may experience; your pain threshold may be lowered, which simply means feeling pain just got easier, and faster. And finally, as we've seen above, injury tends to stimulate nerves. Because nerves branch out as they proceed from your spinal nerve root to the periphery of your body, the root of the branch that serves the injured area may also send pain signals, via another branch, to the nearby fascia. The thoracolumbar fascia is divided into three layers: the back layer (called the posterior layer), the middle layer, and the front layer (called the anterior layer). 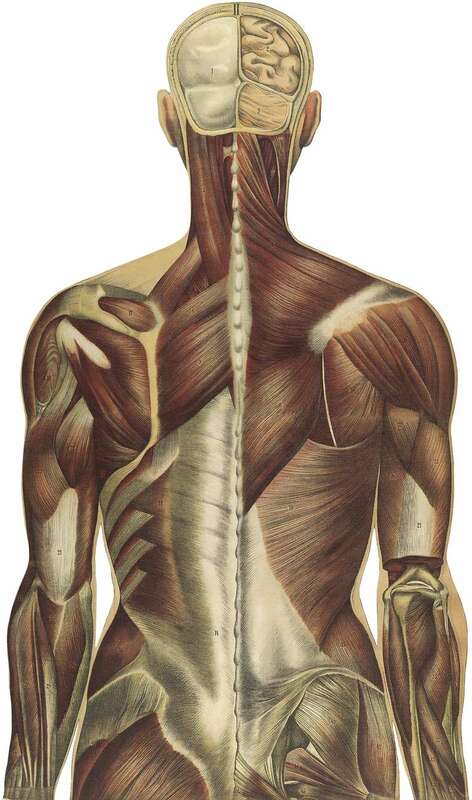 Many back muscles attach to the thoracolumbar fascia. For example, the erector spinae, a muscle group also known as the paraspinals, run longitudinally down the spine. The paraspinals are attached to the thoracolumbar fascia, as well as to the bony spine. The lumbar part of the posterior layer of the thoracolumbar fascia extends from the 12th (lowest) rib down to the top of your hip bone (called the iliac crest). Along the way, it connects with the internal oblique abdominal muscle and the transverse abdominal muscle. Because of these connections, the thoracolumbar fascia helps bridge the muscles of the back to the muscles of the abdominal wall. The front part of the thoracolumbar fascia (the anterior layer) covers a muscle called the quadratus lumborum. The quadratus lumborum bends the trunk to the side and helps maintain a healthy upright posture. The quadratus, as it is sometimes called for short, is often implicated in muscle-related low back pain. Loukas M. et. al. Anatomy and biomechanics of the vertebral aponeurosis part of the posterior layer of the thoracolumbar fascia." Surg Radiol Anat March 2008. Moore, K., Dalley, A. Clinically Oriented Anatomy. Fifth. Edition. Lippincott,Williams & Wilkins. 2006. Baltimore. Nickelston, P., D.C., Thoracolumbar Fascia: The Chronic Pain Linchpin. Dynamic Chiropractic. November 2013. Wilke, J., et. al. The Lumbodorsal Fascia as a Potential Source of Low Back Pain: A Narrative Review. Biomed Res Int. May 2017.